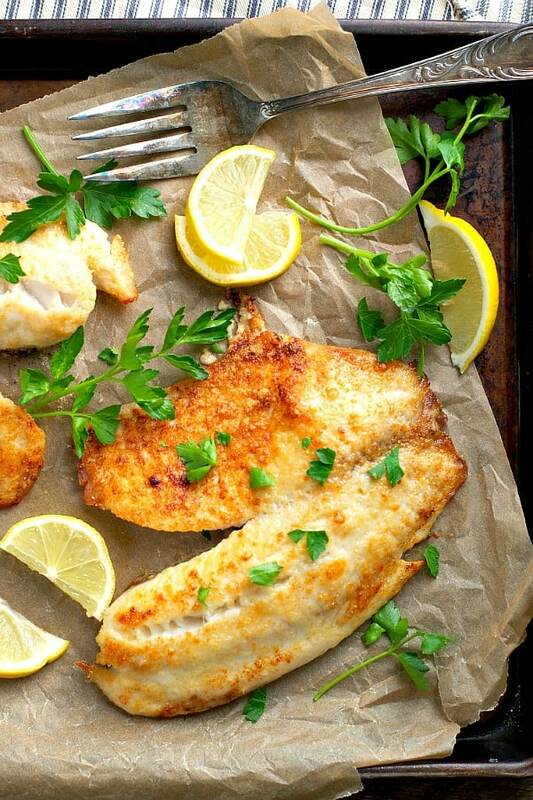 A delicious, easy and healthy garlic parmesan Tilapia. Made with only 5 ingredients and ready in only 15 minutes flat! When you think about the biggest hurdles that you face each night to get dinner on the table for your family, what comes to mind? Are you short on time or just too tired to cook? Feeling uninspired and bored with the same few meals? Or maybe you’re trying to cater to multiple picky eaters who can’t agree on a single dish? Well today’s 5-Ingredient Garlic Parmesan Tilapia is about to bust through any of these roadblocks — making your weeknight dinners a bit less chaotic, a bit healthier, and a whole lot tastier! No matter what reasons you have for dreading the dinnertime hustle, I’m telling you: I can relate. 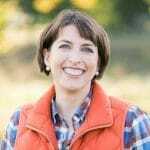 At different points in time, and depending on the day, I have certainly confronted each of these obstacles…and more. It’s called life. It’s called parenting. And it doesn’t have to be quite so tough. 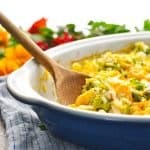 With just a few simple tricks up your sleeve, you can transform family meals from a stressful guilt-inducing race through the drive-thru into a calmer, more enjoyable experience that brings everyone together at the end of a busy day. Will each dinner be perfect? Heck no! We still have our fair share of food-snubbing, milk-spilling, and tantrum-throwing during supper (especially when the 3-year-old has missed one too many naps); but I can honestly say that meals like this Garlic Parmesan Tilapia make the end of the day far easier than it used to be. First of all, you only need 5 ingredients — most of which are pantry staples. You can also keep the fish in the freezer until you’re ready to use it, so this is one option that will save you a last-minute trip to the grocery store. Second, the dinner is a lighter, healthier, protein-packed option (perfect for your New Year goals), yet it’s still made with delicious, familiar ingredients that your children will love. We’re talking butter, garlic, Parmesan cheese, and a very mild, tender white fish. Who wouldn’t devour that?! 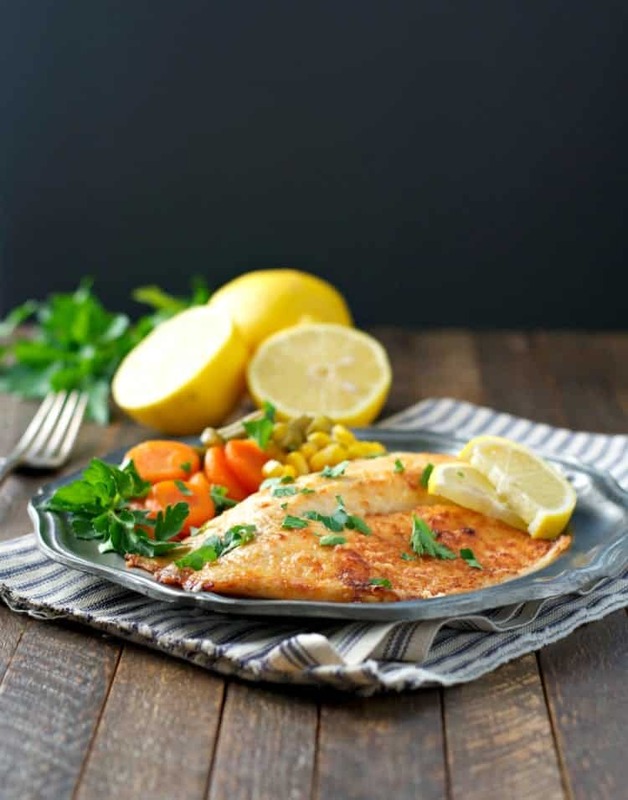 And finally (but perhaps most important), this Garlic Parmesan Tilapia is an easy and healthy dinner that only requires about 5 minutes of prep! We all have time for that! This simple recipe only requires about 5 minutes of prep and 10 minutes in the oven! First, you’ll brush the fish with a garlic butter mixture. Then just pop the tilapia under the broiler for about 5-6 minutes on each side. Sprinkle the grated Parmesan on top of the fish during the final few minutes for the perfect crispy, flavorful finishing touch! A simple green salad tossed with Italian Balsamic Vinaigrette. I hope that you’ll add these 5 simple ingredients to your next shopping list! 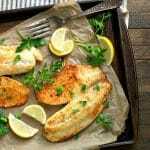 This easy tilapia recipe will save your sanity on even the busiest evenings, and you’ll soon find yourself leaping over those dinnertime hurdles with a pep in your step! 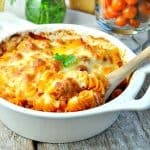 Serving Sizes – This recipe yields four very large servings. If you’re cooking for two, or if you have smaller appetites to feed, I would suggest using only two or three tilapia fillets. Serving Sizes - This recipe yields four very large servings. If you're cooking for two, or if you have smaller appetites to feed, I would suggest using only two or three tilapia fillets. This post was originally published in January, 2017. It was updated in December, 2018. This tilapia looks so good, Blair! 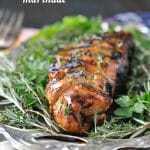 My husband and I eat fish quite often, and I’m always looking for new ways to prepare it. 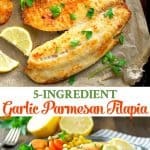 Garlic and parm is a favorite of mine, so this tilapia looks perfect! I know — fish can get boring quickly. This is such a simple and delicious twist! Hope you try it! I love your easy recipe. My husband is not big on parmesan, so I substituted it with a tsp of ground ginger. I also use parchment paper instead of foiling the pan. Guaranteed non stick. I have also tried paprika as an addition. (1tsp) it was quite yummy. Great suggestions, Mariah! Thank you! This looks incredible! I haven’t seen those Libby’s veggies. I want to try with your fish! Thanks, Natalie! Yep — this is one of those great seafood dishes that appeals to the little ones as well! Oh my goodness, this tiliapia looks solo good! I usually am not a huge fan of tilipia because the way I cook it is too bland, but if were like this, I’d enjoy so much more! I normally bake my fish but am going to try your broiling method. I really like the “crust” it produces, looks great and I am sure it taste wonderful as well. P.S. I think step 6 might be a typo since you have already broiled the fish? Or do yo still need to bake it after broiling? Mila, thank you for catching that typo! I updated the recipe so it should be more clear now! Thank you again for noticing the mistake, and I hope that you get to try it! This is such a great recipe ! 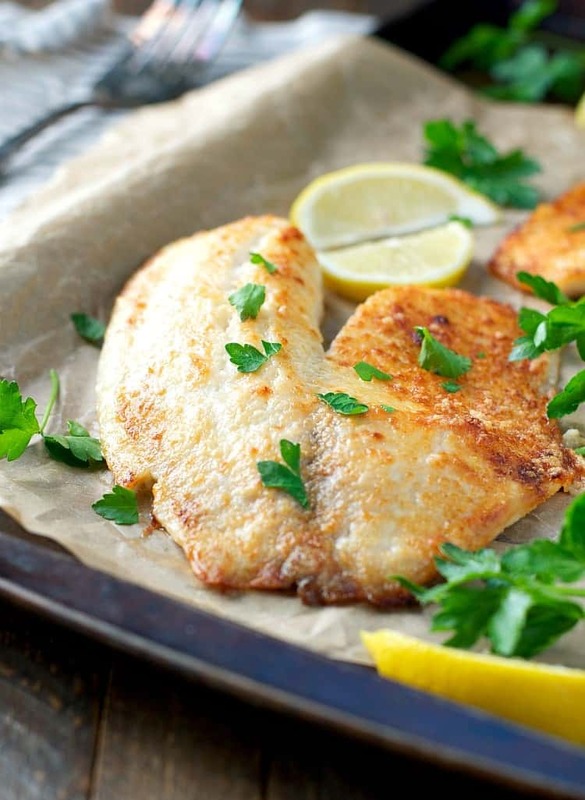 Can’t go wrong with with white fish, parsley and lemon and it’s ready in no time. I love these kind of recipes because it gets the message across that you don’t have to be afraid to cook fish, lol. Not sure why that’s such a problem but it seems to be a common fear. I”m much more concerned about messing up an expensive steak! 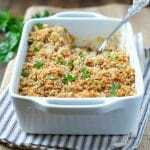 Hi, this recipie looks super delicious and super easy! But do you broil on hi or low? And how far away from the broiler are you cooking the fish? Thanks! Hi, Paige! I broil on HIGH, and I keep my fish about 4-6 inches below the broiler. However, broilers tend to be different, so just keep your eye on your fish and make sure that it’s not burning too quickly (or too slowly). Hi… do you keep broiler door open when you broil or keep it closed as you do when baking? Does it have to be fresh fish or can it be frozen? And do you cook it the same way frozen? Hi, Amanda! Nope, it doesn’t need to be fresh fish. I often use frozen fish! You will just want to thaw the fish in the refrigerator before cooking. What degrees to I preheat the oven ? Hey, Angela! Thanks so much for your kind words! 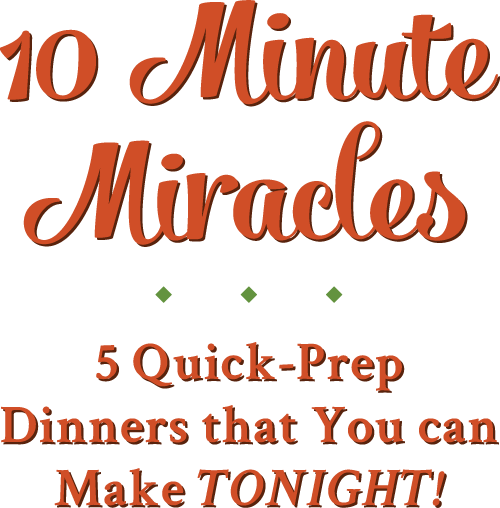 I definitely do NOT make multiple meals each night — I don’t have time (or energy) for that! For the most part, my kids eat what I serve. My oldest and my youngest are definitely pickier eaters, but they have learned to at least try most of what I serve. More often than not, if they just take one bite, they realize that they actually like it! Sometimes it takes a few tries before they come around, but I’m persistent and I just keep serving what I want to serve, and they usually get on board eventually! I hope that helps, and thanks so much for following along! Thanks so much for your thoughtful note! I hope that you enjoy the fish! I agree — the flavors would be perfect with just about any type of white fish! Best fish recipe I’ve used in a long time. Also the easiest. Can’t wait to use again. Actually tasted the flavor and it was the perfect crispness. Thank you!! Hi Blair, I plan on making this for dinner for my family and checked my oven for the broiler setting and it’s set to 500 F. Should I decrease the temperature or leave it at 500? Hi! 🙂 What do you mean by “bottom side UP” ? Thanks for this quick and easy recipe that I made tonight. I added fresh steamed green beans and I used a small crock egg poacher which only takes 2 minutes for the beans. Living alone and only having to feed 1 mouth has made the small steamer a must have. When I did have family members living with me, I would definitely have tried the Libby vegetable pouches. Looked great. Wow! 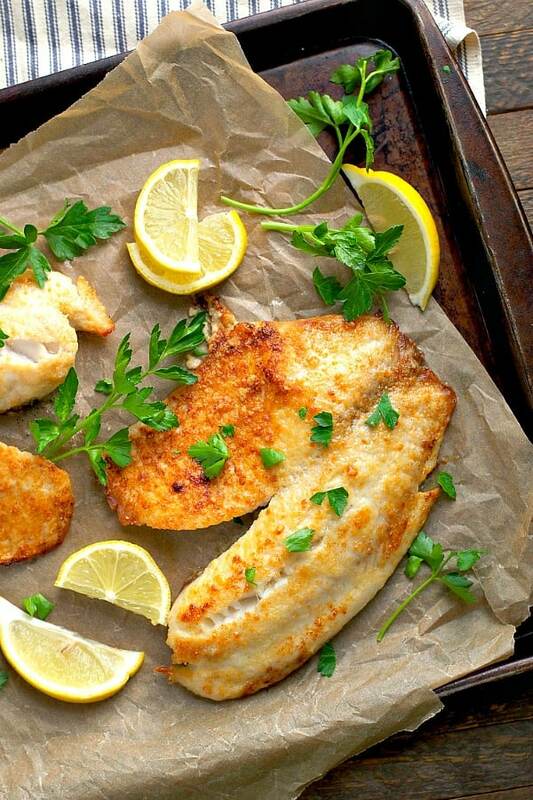 What a smart idea to broil tilapia with those 5 ingredients. The parmesan cheese added such a great touch and the broiling tip made it delicious. To complement my meal, I boiled fettuccine noddles and added the leftover 5 ingredients as a sauce. I’m a new fan. Can’t wait to try a new recipe recommendation from you. Hi, Jennifer! I’m so glad that you found the blog and that you enjoyed the fish. That small steamer sounds ideal for a single-person household, and the addition of pasta must have been delicious. Hi. I was wondering if you used fresh grated or the green jar/canister of grated Parmesan? Thanks! There’s a reason that Chef say that cheese and fish doesn’t go together and another reason why I always, always never cook fish with any kind of fish….well tonight I decided to give it a try but what a disappointment it was from everyone at the kitchen table!! PS I used a combination of fresh grated from a big Costco block and the shaker stuff! Both are great! I made this recipe but did cooked it in foil pouches turned out amazing. With 2 family members having problems with fat and dairy, the butter is a challenge for us. Has this ever been tried with olive oil instead? I worry that the heat of broiling would make it smoke. Hi, Linda! Butter has a smoke point of 350 degrees F, which isn’t very high compared to a lot of oils. While I prefer the flavor of the butter, you should be fine replacing it with an oil instead. A high quality (low acidity) extra virgin olive oil has a smoke point of 400 degrees F, so that would be a good option. Another great oil that stands up to high heat is avocado oil, which has a smoke point of 520 degrees F. Hope that helps! Is there a way to cook this in a frying pan as my oven doesn’t work. Really great recipe. Thanks. However, you should consider taking down your comment about how you used parchment paper. Even though I kept my fish six inches away from the broiler, my parchment paper nearly caught on fire. There are many novice cooks who might not see the danger of using parchment paper with a broiler recipe who may not end up as lucky as I did. I love most seafood, with that being said, I’ve never cared for the different recipes that I’ve used in the past!! HOWEVER, I made this today and this was soooooo yummy. The flavors marry together so well. I baked 2 fillets (even frozen, mind you). Ate one for lunch and while running errands – my mouth kept watering thinking about the absolute luscious ness. I paired my fish with some raw peppers, riced cauliflower and fresh beans !!!! Thank you somuchfor sharing your recipe. I’ll try and upload a pic of it!! I love that, Michelle! Thank you so much for your kind note. I had to laugh, because I was scrolling through Amazon when I saw your comment pop up. 🙂 Glad that you enjoyed the fish! Thank you for sharing this recipe. I followed your exact recipe and added a little extra Parmesan. Delish! !